The MDW series consists of single output DC/DC converters that provides 20 watts of output power in a low profile 2 x 1 x 0.4 inch package. These converters feature a 4:1 wide input voltage range of 9-36VDC or 18-75VDC as well as positive or negative remote on/off, 1600VDC I/O isolation, trimmable output voltage, and six-sided shielding. These converters are also protected against over current, over voltage, input under voltage, and short circuit conditions. All models are particularly suited for telecommunications, industrial, mobile telecom, and test equipment applications. Notes: 1. The On/Off control function is positive logic (standard) and negative logic (optional). 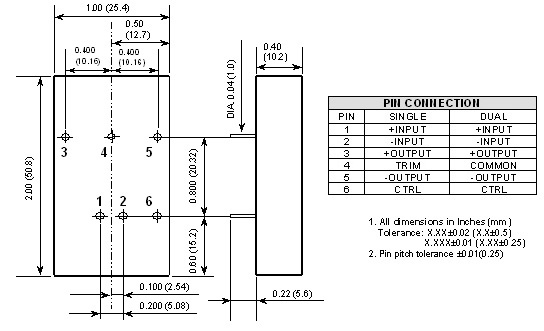 The pin voltage is referenced to the negative input. To order negative logic On/Off control add the suffix "R" (Ex. MDW48S5-4000R). 2. MTBF: BELLCORE TR-NWT-000332 Case 1: 50% stress, temperature at 40°C (ground fixed and controlled environment). MIL-STD-217F Notice 2 @ Ta = 25°C, full load (ground, benign, controlled environment). 3. 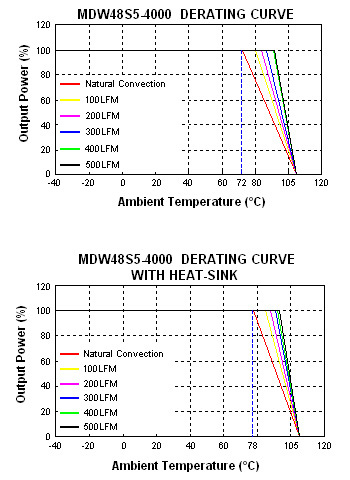 Heat sink is optional, call factory for ordering details. 4. The MDW Series required an external filter to meet EN55022 class A.